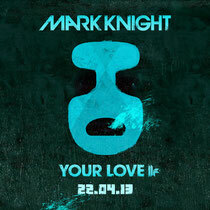 In a top year of releases for Toolroom Records, label leader Mark Knight gets set to release his new track ‘Your Love’ (formerly ‘Can’t Get You Out Of My Head’). Twice nominated in this year’s International Dance Music Awards, Mark Knight uses crisp percussion, a big bassline and a cheeky nod to a pop princess to bring a new take to some classic sounds. The track should appeal to new generations of fans as well as dance music aficionados and accompanying the release is a music video filmed in an intimate location that captures the spirit of the track and the scene. In both the track and the official music video, Mark combines his production knowledge with a genuine love of the music and people that make up the scene. It’s out April 22.